Home » art » WHAT MAKES AN ARTIST? A packed auditorium at Tate Modern came to hear ‘National Treasure’ and ‘Poster Boy for Craft’ (his words), Grayson Perry in discussion with author Sarah Thornton. The event was to publicise Perry’s latest outpouring on the art world, loosely based on his Reith Lecture series and Thortons’s forthcoming book 33 Artists in 3 Acts investigating issues of credibility and the relationship between artist’s everyday lives and their art practices. Artists under the scalpel included Marina Abramovic, Isaac Julian, Damian Hirst, Jeff Koons, Cindy Sherman – and Perry himself, of course. ‘Coolness’, he went on to say , ‘is the enemy of creativity’ but my favourite Perry observation, was ‘the validation of academics is one of the big cash cows of people like me’. Not to be outdone, Thornton had some good lines of her own. They both agreed that a career in art is a tough marathon and not a sprint. In other words a long hard slog with no guarantee of success at the end. Grayson puzzles me. He is on the cover of endless newspaper supplements, gives countless interviews and currently guest editor of The New Statesman. When on earth does he have time for his day job? He is an authoritative voice, gives great pleasure to many and his creative originality speak volumes. Like Joanna Lumley, I suppose he does qualify as a National Treasure. 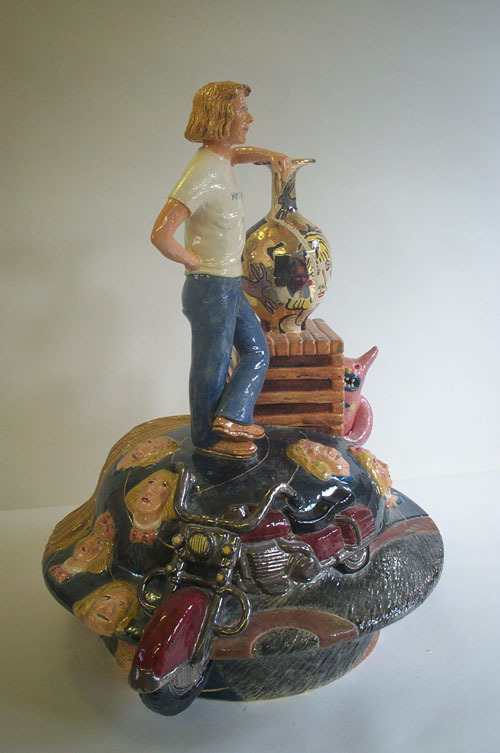 If you admire Grayson Perry you might appreciate the work of potter CAROLE WINDHAM who ‘is rooted in the Pop Art movement of the 1960’s and the Staffordshire Potters of the 19th Century. 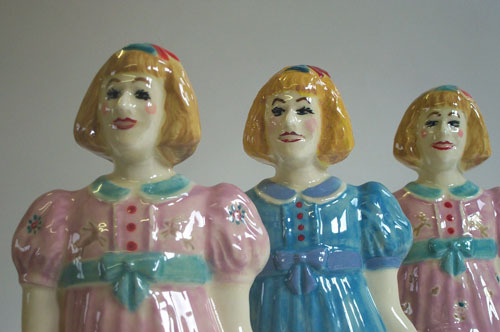 I have always (she says) found it interesting to use ceramics to comment on everyday images of society, celebrity and ephemera. My current work reflects the effects that technology is having on everyday life’. 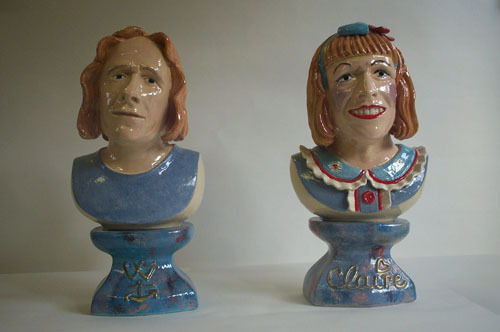 These Wanker and Claire look very familiar!!! Love it. Fabulous work by Carole Windham. She should be far more widely known.